Stress Toys to help with focus, attention, calming, and active listening. Do you find yourself frustrated sitting in class, in a meeting, doing homework, or stuck in your seat for long ride aching for something to do? Are you a chronic leg shaker, pen clicker, nail biter, or like me, a finger drummer? 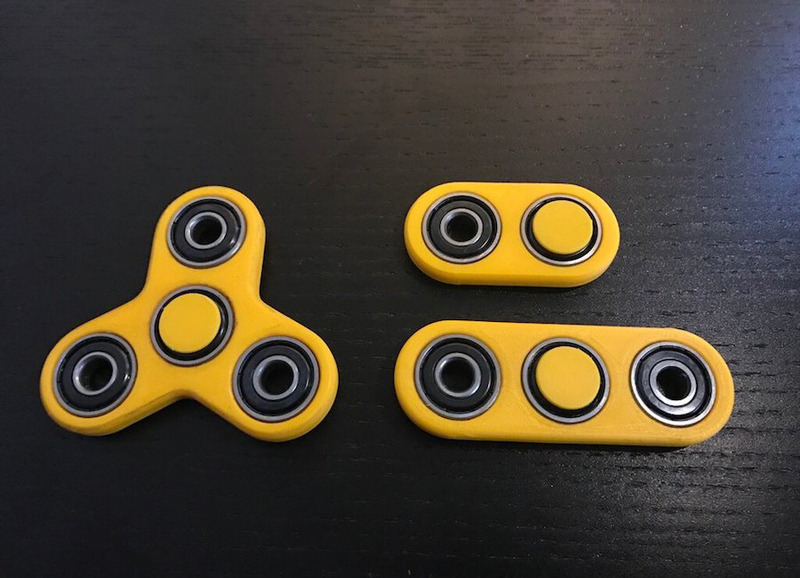 Then a fidget spinner may just be what you need to work out that stress and frustration! 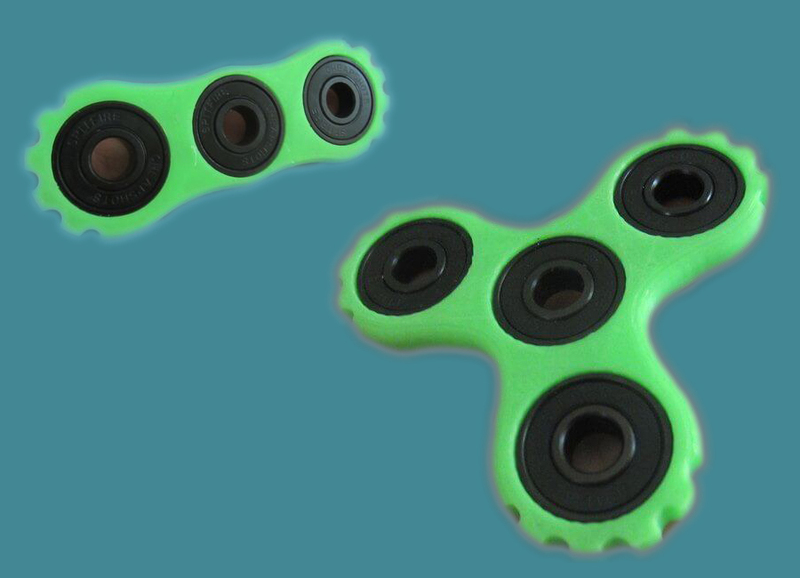 Fidget Spinners provide a great outlet for all of your nervous energy without making a sound so they're perfect for school, work, coffee shops, anywhere you don't want to be disruptive. Experts believe that doing something that uses a sense other than what's needed for your primary task can make it easier to focus and improve performance. 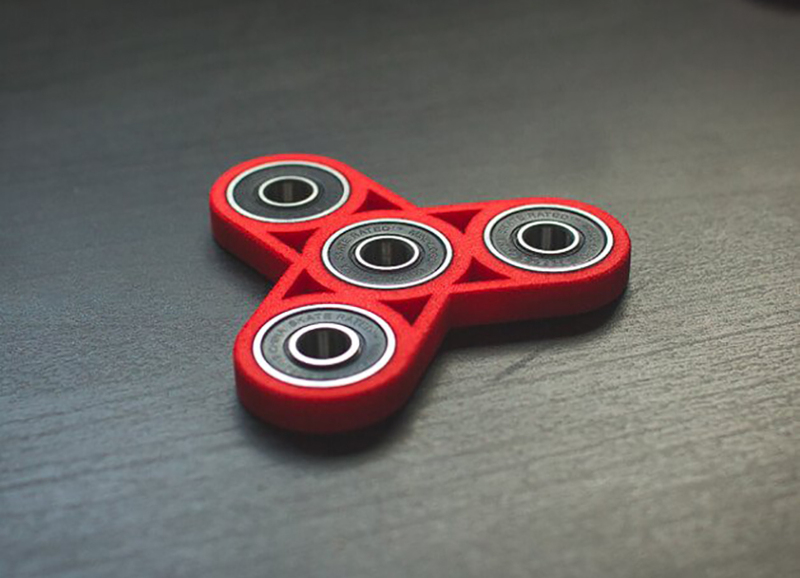 Studies have shown that Fidgets also provide self regulation and provide a calming influence especially in children and adults with autism and ADHD. So if you're always being told "Stop that noise!" or "Can't you sit still!" 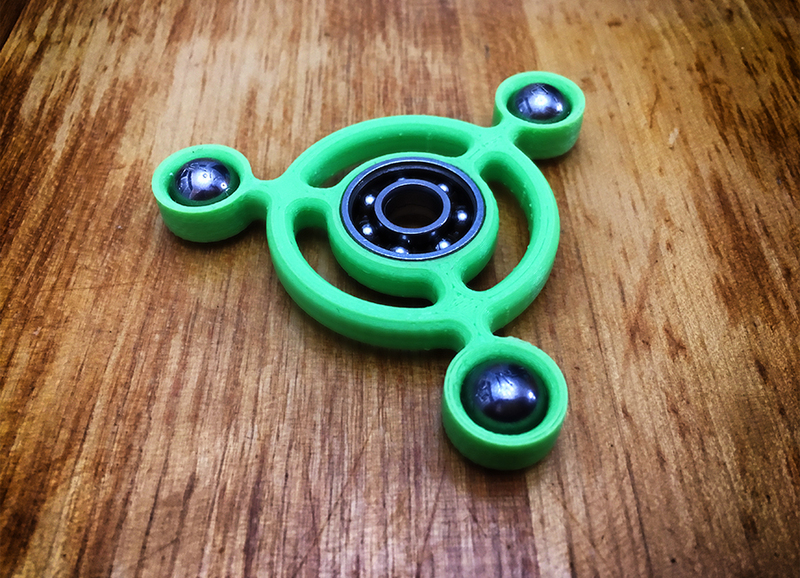 a Fidget Spinner may literally be just what the doctor ordered! If you have any questions, comments, or would like to place an order we'd love to hear from you! Just click HERE to send us a note at info@ehrenfidgets.com and we'll get right back to you! Ehren is a clever, curious, and inventive fifth grader who loves technology, snowboarding, and his pet bunny Ivy. 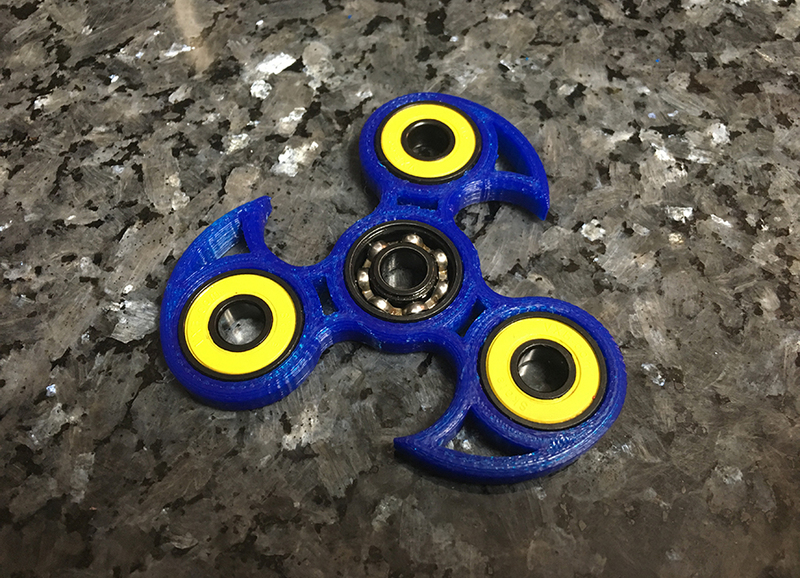 This is the fidget that started it all! Simple and elegant, The Capsule is available as a Simplex, Duplex, or Triplex, with or without the spinning bearing cover. 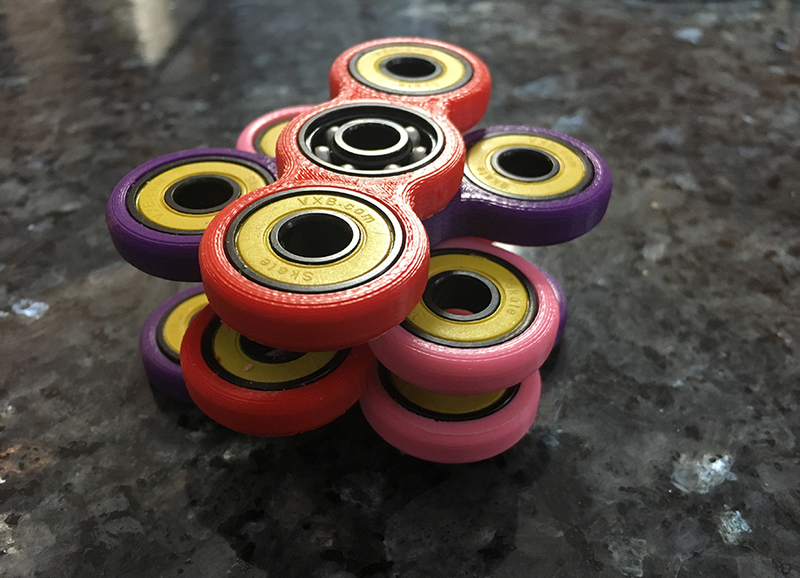 Like all of our fidgets it comes standard with all steel ABEC bearings. Looking for more spin? Upgrade the center bearing to a Bones Red for an additional $5. 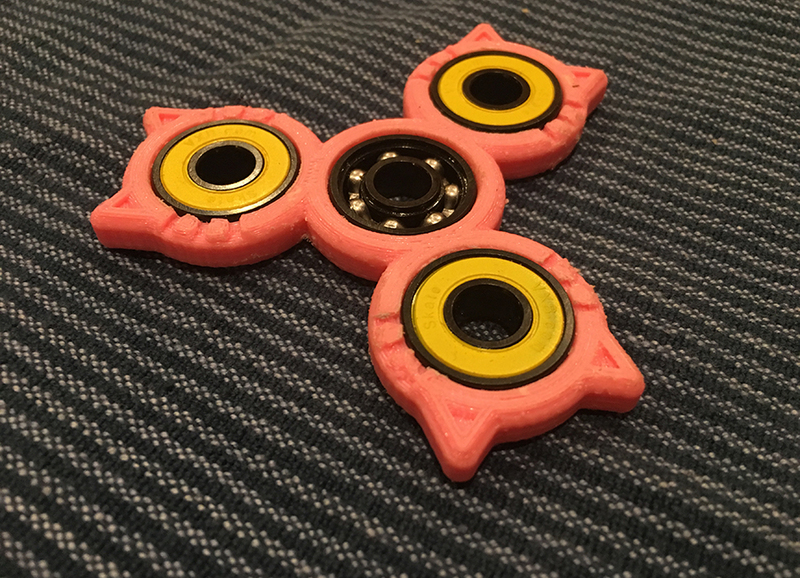 The body of the fidget is available in your choice of Red, Pink, Black, Purple, White, Grey, Brown, Neon Green Corn Starch based Plastic that is 100% Renewable, Biodegradable, and compostable! 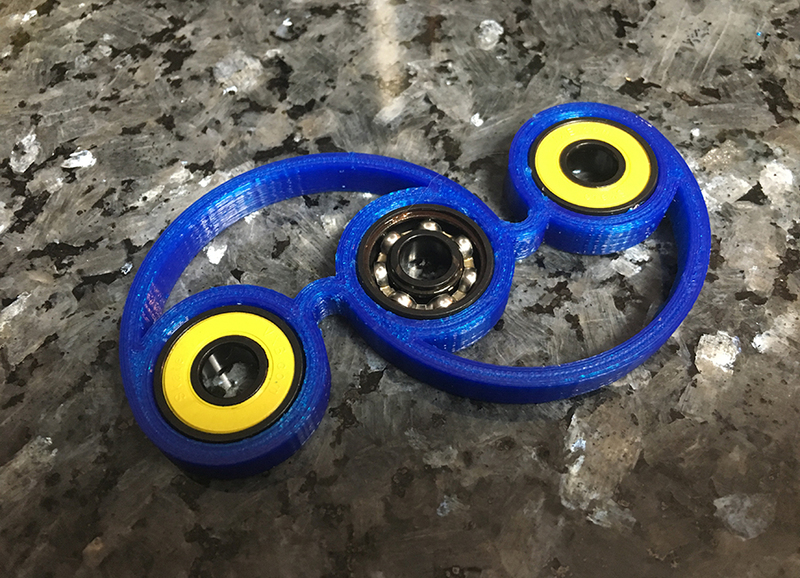 NOTE: We cannot guarantee the color of the bearing seals. 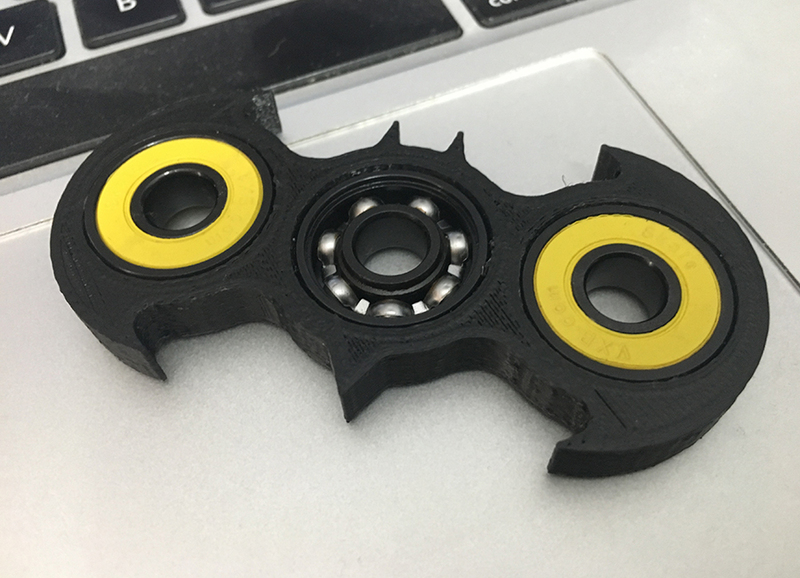 Holy Fidget Spinner Batman! 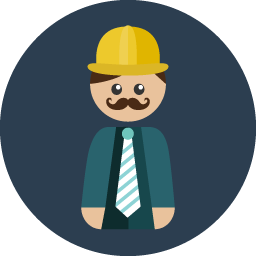 I'm sure if you look in one of the pockets of The Dark Knight's utility belt you find one of these guys! Watch out Spacely's Sprockets, because Cogeswell Cogs is spinning out of control! We've taken the Capsule and made it a little more edgy! Hoo Hoo! Why The Owl you ask? Take a closer look and you'll see two pairs of wise eyes staring back at you, and like a real owl, this one too can spin its head round 'n round. Take a close look and you'll the the cresting and crashing waves of a powerful Tsunami that inspired this design. 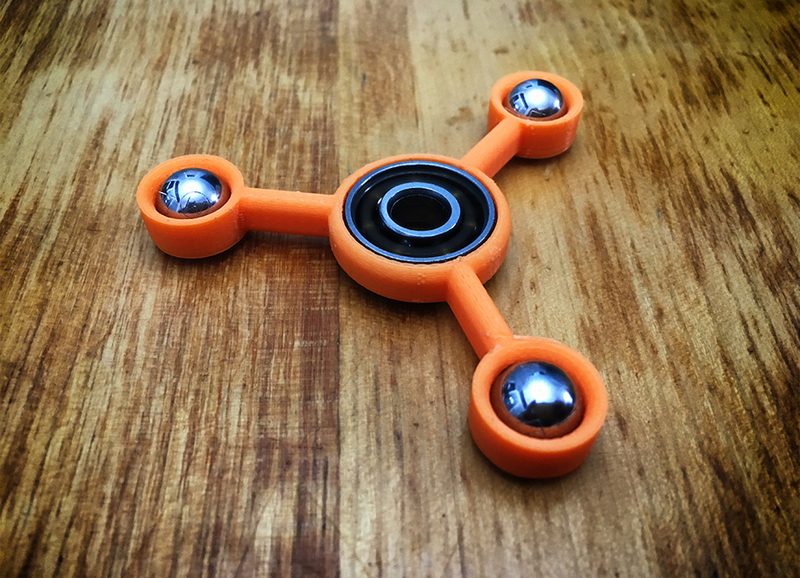 Precision balance means this fidget spins fast and true. Meeeeow!! What else can I say, cats are the animals that power the internet, so bring some of that Kitty Power to your pocket! A more geometric take on the Capsule Triplex Spinner, The Star incorporates a 6 pointed star into its smooth edged design. 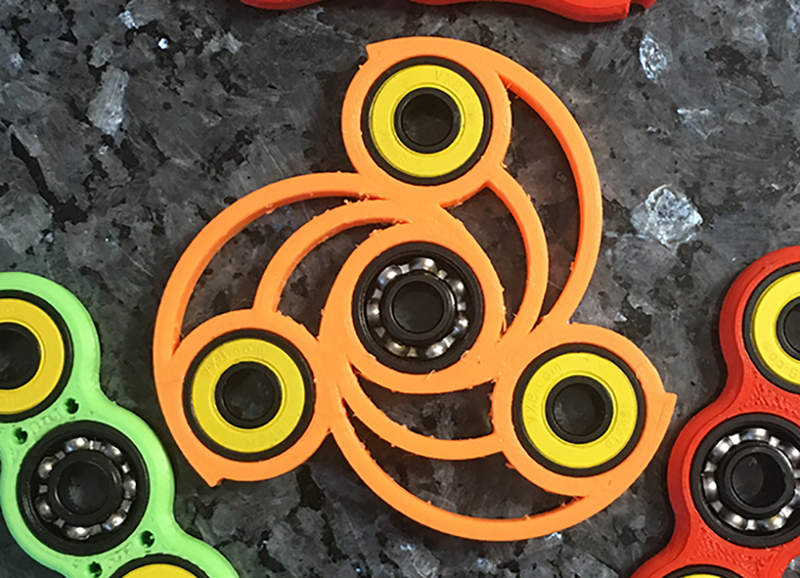 A quick and stable Triplex spinner, the Raptor is modeled after a Velociraptor's razor sharp claw. Not to worry, we've taken the edge off to ensure hours of safe fideting. One of our most popular designs, The Curves is all about comfort. All of the edges have been smoothed and curved to provide a firm yet comfortable grip. 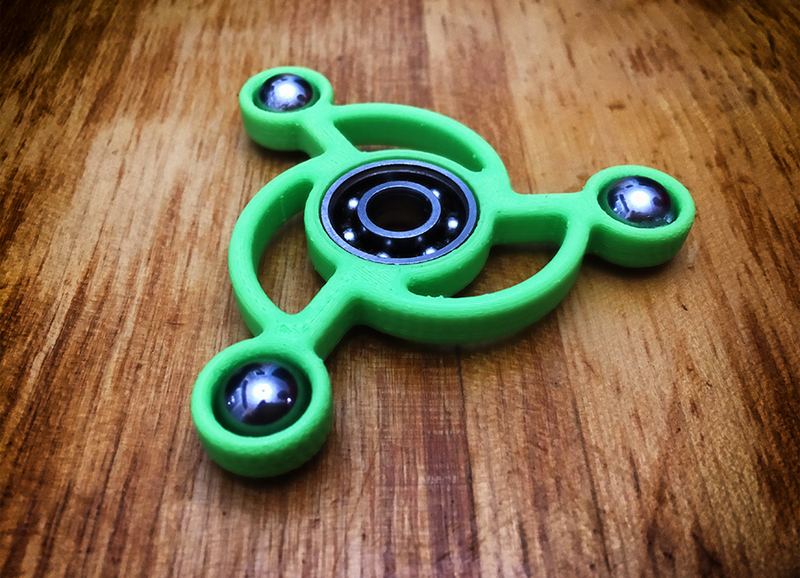 Our smallest fidget, this is perfect for even the littlest hands. The fist addition to the Atomic Collection, the Element is simplicity at its most basic level. Compact but sturdy and loaded with 3 11mm chrome steel ball bearings this baby really moves! It's compact design is great for smaller hands too! Part of the Atomic Collection, the Molecule's offset arcs look great and give you something to hold on to! Loaded with 3 11mm chrome steel ball bearings this baby really moves! It's compact design is great for smaller hands too! Part of the Atomic Collection, the Orbit's concentric circles look awesome when they're spinning! Loaded with 3 11mm chrome steel ball bearings this baby really moves! It's compact design is great for smaller hands too!